Our New Process is simple and easy to use. Fill out the reservation information below. Select the DAYS your team will play or select all the days if you want the Entire Event Option for $ 36.00. Select the number of seats you would like to reserve. The cost of the seats are: $ 6.00 plus tax/day. After completing the payment information, click on the SEND RESERVATION button. Once your reservation has been accepted, you will receive a confirmation email confirming your reservation and a QR Code that we will use to track your reservation. Think Southwest Airlines,,,,Quick, Easy, Simple! 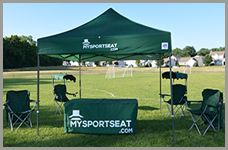 One the day of the event, simply locate a MySportSeat Kiosk, we will scan your code, give you your seat and you are on your way. After your game is complete,YOUR SEAT’s must be returned to our Kiosk. PLEASE MAKE SURE ALL SEATS ARE RETURNED AFTER EACH GAME AND NOT PUT IN YOUR CAR. Repeat pick up and return process for each of your games over the course of the event.